Four of our hens will be turning three in August. Everything I've read says hens lay best in the first 18 months or so then it's a gradual decline from there. Lately, things have become a little unpredictable with their laying schedules, and Chickabod is the most recent one to have some issues. She has laid tiny little eggs before (people in the know refer to these as "fart eggs") with no yolk just a little bit of white, so when I got one of those from her last month I didn't think much of it. But after that tiny egg, she stopped laying altogether for over a month. I was really worried because typically that is the first sign that there may be something wrong. I watched her closely and she seemed to be healthy and normal, so I just waited it out. I've heard of hens going on "egg strikes" before but it had never happened to mine. Finally, she started laying again a couple of weeks ago, and I breathed a sigh of relief. She had to lay a few practice eggs before she got it just right. Fart egg on the left, normal sized egg on the right. The tiny eggs are so cute I don't want to crack them open! But I am curious if there is yolk in any of them, so sooner or later my curiosity will get the best of me. It also appears that one of our new pullets is laying. We've found four smallish cute eggs in the nesting box over the past week or so (normal sized egg on left for comparison). Not sure who is laying them, so I've been doing some investigative work to get to the bottom of it. They wouldn't talk, so I'm off to explore other potential leads. 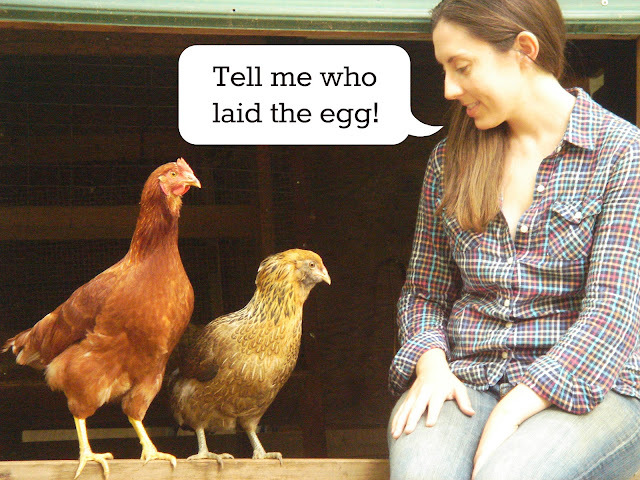 Did they tell you which one laid the egg? And if so, maybe you can ask them which really did come first....the chicken or the egg? And, can you eat fart eggs? Yep, you can eat fart eggs. It's just white inside. I normally just use them when I'm cooking eggs and add them to the others. Guess if you had a ton of them you could make an egg white omelet! LOL--- Seriously. I did. Great post. Thanks, Sonja. The chickens are always good for a laugh.